Carcinogens In Your Skin & Body Care. Plus 3 Myths Dispelled. You know me, I’m all about the whole food lifestyle. Get moving, get outside and transition into a whole food active and healthy lifestyle. I love that all of you are somewhere along this transition path. Some of you are just beginning, some of you 90% there (yeah you!). However, as we are making these great health decisions, it’s come to my attention that most of you are balancing this with smearing toxic skincare on yourself every day. I’ve been getting calls about this very thing A LOT over the last couple of months. I think people are becoming more aware of what they are putting on their skin, which is a good thing. I’m going to start a video series over on my YouTube channel to address all of these concerns. Over the next weeks and months, I’m taking you into my bathroom to share what I use. I’ll be talking moisturizer, makeup, deodorant, bath soap, shampoo, tanners, toothpaste, the whole 9 yards. Below, I explain why you should care about taking a second look at your bathroom. 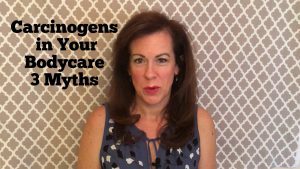 First things first, I want to dispel 3 myths concerning your skin! The FDA. People seem to think that if products are on the shelf in CVS or Target or Bloomingdales that the FDA has said that it’s safe for you. Don’t be fooled. There are toxins in most skincare on the market, from budget to high end, that are carcinogenic, and endocrine disruptors. Many ingredients are neurotoxins and cause birth defects. It’s up to you to investigate what you put on your body and if your comfortable with the risk. But, you need to know the risk. The Skin is not a Raincoat. People seem to think that it doesn’t matter what they put on their skin because nothing penetrates. This is WRONG! When you put things on your skin, they begin to be absorbed into the blood system in as little as 26 seconds. So, you might want to think twice before using known carcinogens on your skin. Advertising Green Washing. Let’s give it up to the advertising industry. I mean they can be straight up geniuses and we buy right into it. But, let’s be clear here, just because a product ADDS botanicals to a formula doesn’t make it all natural and non-toxic. Remember, they ADDED botanicals, they didn’t REMOVE toxins. I hear I use natural (insert item here), it’s full of botanicals that calm the skin. Well, that’s great, except it’s also full of toxic chemicals! Don’t buy into green washing. You must read the ingredient labels on products. So, stay tuned for more videos to come. I will be revealing the brands and specific products that I use and explain why. Be sure you’re subscribed to the YouTube channel so you get notifications when the videos go up. You can CLICK HERE to see the video. If you want me to cover specific concerns or products, just leave a comment here. This entry was written by Dr. Shelly Masters , posted on Friday March 03 2017at 11:03 am , filed under Uncategorized and tagged birth defects, bodycare, carcinogens, chemicals, endocrine disruptors, green beauty, indie green beauty, makeup, moisturizer, natural skincare, neurotoxins, non-toxic makeup, nontoxic skincare, self tanners, toxic, toxic skincare . Bookmark the permalink . Post a comment below or leave a trackback: Trackback URL.